Books are also available at Timberland Regional Library. The tie that binds the chapters of “Too Far from the Tree”together is family – five generations of my gene pool with me in the middle. The ties that bind my family are sometimes touching, often humorous tales, such as my mother’s legendary recycling efforts, including her egg-carton lampshades (still in existence), and my daughter’s insistence on finding out where she was before she was conceived. Others – such as the story of my Depression-era grandmother’s no-nonsense quest to get her brood of children a college education – are peppered with personalities. 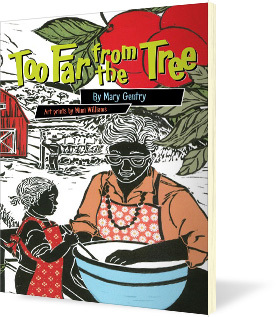 In truth, “Too Far from the Tree” could be subtitled, “a guide book to the museum of my heart.” Some are stories of forgetting and being forgotten; some are of remembering and being surprised. The stories contain small truths or realizations that have become for me more significant with time and reflection. Writing about them has been a joyful journey back to my roots. I hope by reading them you will also find your way home. 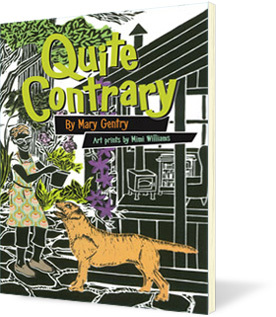 “Quite Contrary” is a collection of personal essays that meanders through the homely stuff of my life. It begins with the day I met my husband Fred and counted his laugh lines. It moves on to the purchase of our home, and later, to remodeling projects. I walk dogs and say goodbye to them. I figure out how to miter corners, all the while wishing I’d never heard of them. I steel myself to crawl behind the dryer and tackle dust mites. Along the way, I fall off the bulkhead, breaking my hip, and later celebrate that I no longer have to ski vertical trails marked with double black diamonds. The retelling of these very ordinary happenings resonates with readers in a profound, yet humorous way. Featuring art prints by Mimi Williams.